This year, the ESTIV (European Society of Toxicology In Vitro) congress took place in Berlin and was again a very interesting symposium. The plenary session was open by a presentation on 3D models made by bioengineering made by Paula Alves (Oireas/PT), and this year, a lot of presentations and poster were focused on 3D models and their application in toxicology. 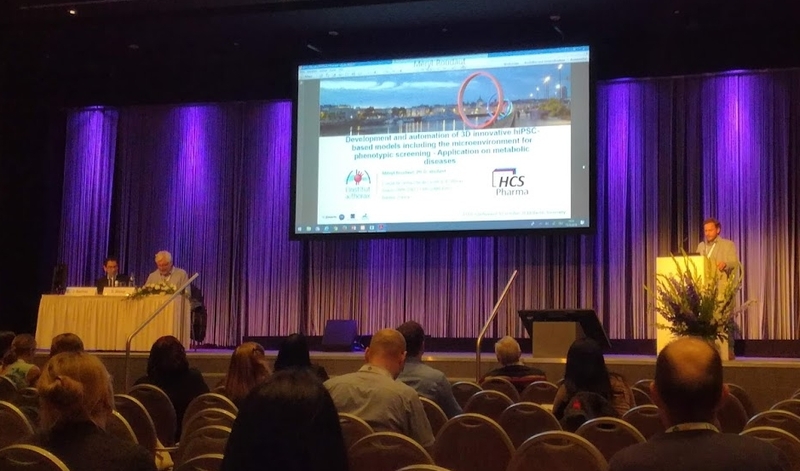 Our PhD student Meryl Roudaut presented a very interesting presentation on the development and automation of 3D innovative hiPSC-based models including the microenvironment for phenotypic screening. We were also present in the poster section to present our works on the characterisation of 3D cultured primary human hepatocytes and HepaRG for DMSO-free preclinical toxicity testing. This work was made in collaboration with NUMECAN, from Rennes University, FRANCE. During this year symposium we were captivated by the rising of 3D culture and iPS derived cells in the field of in vitro toxicology. HCS Pharma has develloped genotoxicity and hepatotoxicity assays from 2D and 3D model, and we are confident that our new technology BIOMIMESYS will bring news solutions for 3D model and iPCS derived cells differenciation.